Scientists have found that an elusive millipede species near San Luis Obispo can actually glow. 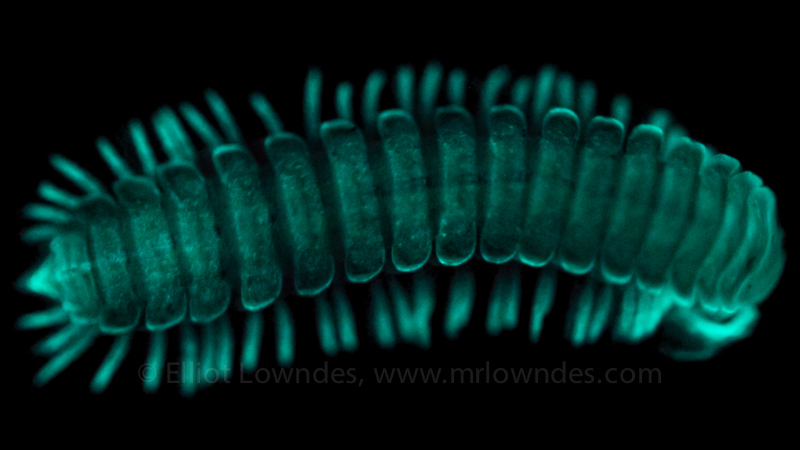 These millipedes were first—and last—seen in 1967, but no one knew that they glowed until their rediscovery in 2013. Remarkably, in that same year students from UC Davis discovered glowing millipedes on Alcatraz Island, crawling quietly around the famous penitentiary. However, the two glows are completely different. 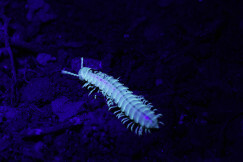 The Alcatraz millipedes are fluorescent, which means they shine only when illuminated with a blacklight. Fluorescence is often seen in millipedes. According to UC Davis undergraduate researcher Alexander Nguyen, the animals on Alcatraz belong to a well-known Northern California species. And the new species from San Luis Obispo (SLO) is likely to fluoresce too. 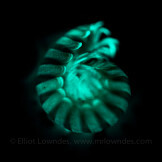 But the SLO species can also produce its own light from scratch, a process called bioluminescence. Though bioluminescence is rare among millipedes, California is relatively rich in such luminous species. The SLO species is the eleventh California luminous millipede—and has the faintest glow of all. That might seem disappointing, but the animal’s very dimness offers a key to the long-standing puzzle of how luminescence evolved in this group. Entomologists Paul Marek of Virginia Tech and Wendy Moore of the University of Arizona published a study on May 4th in the journal Proceedings of the National Academy of Sciences showing that the millipedes’ glow actually began as a way to cope with California’s dry heat. California luminous millipedes are all just a few centimeters long, shorter than your finger. Blind and nocturnal, they live in mountain forests and meadows, where they keep to a steady diet of moldy leaves. But they’re not completely harmless—as a defensive measure, their pores ooze cyanide. Their characteristic blue-green glow is thought to warn potential predators about this deadly poison. Warning colors and displays are common throughout the animal kingdom, from monarch butterflies to skunks, but scientists have always struggled to understand how they could evolve. Any new trait begins as a mutation in one or a few individuals, and a warning display isn’t useful on that scale. A large group of animals must all use the same warning before predators can learn to associate it with a nasty taste or a painful poisoning. So if there’s no benefit to the first mutants, how does the trait survive and spread? That’s where the SLO millipede comes in. In addition to shining with the faintest glow of any luminous millipede, it also lives at quite low elevation—just a couple hundred meters. It may not face many predators this close to sea level, because small millipede-munching mammals become more diverse the higher you go. It’s no coincidence that this low-elevation species also has lower toxicity, as indicated by smaller cyanide glands, than its alpine cousins. Among all eleven species of glowing millipedes, Marek and Moore found a continuous relationship between elevation, toxicity, and brightness. The higher a species lives, the more cyanide it makes and the brighter it glows, giving predators an honest signal of the danger posed by each mouthful. So far so good—but there’s still the problem of that “early evolutionary jump.” How and why did the glow spread from the first mutant milipedes? Perhaps the luminescence didn’t originally evolve as a warning. Perhaps it served another purpose, useful to individual mutants from the very beginning. Low elevation doesn’t just mean a lower risk of being eaten—in California, it also means a hotter, drier climate. And hot dry weather stresses out millipedes, just like the rest of us. At the cellular level, this stress produces damaging molecules called reactive oxygen species (ROS). They've been implicated in aging and various forms of cancer, and antioxidants are often touted as a beneficial countermeasure. For a number of animals, however, ROS are also a critical ingredient in a chemical reaction to produce . . . light! In the process of luminescing, the ROS are neutralized. 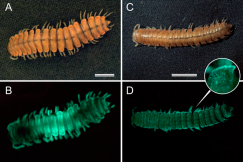 Marek and Moore propose that the millipedes’ glow began as a mere side effect of adapting to the stressful California climate. By neutralizing the ROS in their cells, the initial mutants gained a competitive advantage, and the trait spread throughout the population. Only later was this incidental luminescence co-opted into an active warning signal—by an eyeless animal that has never seen its own light.